Teachers' Subcommittee Report on "Love Your Enemies"
1. The issue of loving our enemies is one of Jesus’ most revolutionary teachings occupying a prominent place in the Sermon on the Mount and in the Kingdom ethos to be shown to the world (Matthew 5:44-48). Thus, the implications of it need to be thought through very carefully. 2. A Christian must act as a disciple of Jesus at all times in all circumstances (meaning in this context, that he must show love to his enemies at all times). The classic argument going back to Augustine and Luther that a Christian has a private self and a public self and can do things in his public self that he would not do in his private self is not biblical. The Scriptures know of no such division within the Christian. “And whatever you do, whether in word or deed, do it all in the name of the Lord Jesus, giving thanks to God the Father through him” (Col. 3:17 NIV). 3. Every Christian needs to be taught to obey Jesus’ commands to love our enemies, pray for them, do good to them, lend to them, be merciful to them and do to them as we would have done to us (Matthew 5:44-48 and Luke 6:27-35). For this to be obeyed, disciples must be encouraged and helped to think through the implications and applications of this teaching. However, in this matter, we do not believe it is best just to tell our members what to practice, but rather teach them how to make wise judgments, remembering, “But solid food is for the mature, for those who have their powers of discernment trained by constant practice to distinguish good from evil” (Hebrews 5:14 ESV). 4. Romans 12:2 (NIV) reads, “Do not conform any longer to the pattern of this world, but be transformed by the renewing of your mind. Then you will be able to test and approve what God's will is—his good, pleasing and perfect will.“ However, on this issue, our respective cultures’ emphases on patriotism and nationalism often has influenced how we view the treatment of enemies more than have the Scriptures—particularly, the teachings of Jesus. This must be changed and our minds must be renewed by God’s wisdom. Whatever decisions we make must be made from consciences informed and shaped by the Word of God. 5. Although the implications of this teaching (love your enemies) may be difficult, all faithful disciples must study and pray about these matters. This is not an option. We must all seek God’s will, for that is the nature of the Kingdom life. 6. The examples of soldiers’ interactions with John the Baptist (Luke 3:14), Jesus (Mark 8:5-13), Peter (Acts 10) should be examined, and consideration should be given to what these situations say and do not say. Whatever conclusions we come to should address these situations, as well as the material at the end of Romans 12 and the beginning of Romans 13. 7. A deeper consideration of our teaching on this subject of loving our enemies will almost certainly lead to some significant shepherding issues in which we help disciples make decisions based on the Bible rather than on culture. These will likely include: (1) Counseling a disciple who wants to enlist in the military (or in some countries is being drafted into the military) about the implications of the military oath; objectives of military training and consequences of travel away from the fellowship. (2) Counseling a disciple currently serving in the military regarding the possibility of serving without violating one’s conscience, as well as what options are available if one’s conscience is violated. (3) Supporting and nurturing individual disciples as they wrestle with and make these difficult decisions. 8. While we believe this area needs to be taught on and explored, we also believe that discussions and collaboration are needed with elders and evangelists in order to handle this in the best way in our congregations, so the church might be unified, built up and grow into maturity (Ephesians 4:11-16). Finally, while those of us on the subcommittee do not agree on every implication and practice that should come from Jesus’ teaching on this matter, we are in complete unity that the command to “love your enemies,” in all its counter-cultural quality, must be studied and implemented by every disciple and practiced in all phases of life. This is a crucial mark of the Kingdom, for in this context Jesus said: "If you greet [show love to] only your brothers, what more are you doing than others? Do not even the Gentiles do the same? Therefore you are to be perfect, as your heavenly Father is perfect” (Matthew 5:47-48 NASB). The previous appeal was written for the evangelists’ service team and elders’ service team to summarize what the teachers’ subcommittee discussed concerning "love your enemy." The following papers represent two different views on this topic. These papers are given to help disciples think through this topic. The papers are not written to tell anyone what to think, but to help each person work through the issue. We want to develop a culture in our churches where diverse perspectives on complex issues can be discussed and respected. In the case of these particular papers, we acknowledge that the majority of the authors are citizens or residents of the United States of America. Those who live in other countries may have a very different perspective from these authors. For the next two years the Navy fought hard against his request to become a conscientious objector. In finally receiving that status, only after taking his case to federal court, Izbicki became one of 300 over a nine-year period who received an honorable discharge as a CO. Another 300 applicants were denied. 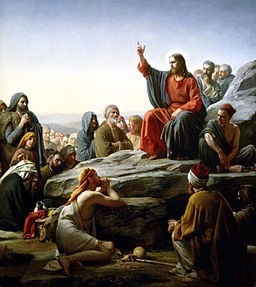 Eventually, he studied the Gospels, read widely about the early history of the church, took up Hebrew so he could read the Old Testament in the original, and started to measure his faith according to the question: What would Jesus do? He concluded, “I could not be responsible for killing anyone.” This led to his unexpected answer on his psychological test and triggered a long series of interrogations. Izbicki’s story illustrates a crucial issue often faced by the disciple of Jesus who lives in a post-Constantinian culture where Christian military service has been taken for granted by most Christian groups for 1800 years. Disciples follow Jesus, who said, “Love your enemies.” But killing enemies is widely accepted and sometimes even expected as a part of Christian obligation. 1. Jesus was the embodiment of the Kingdom. In his person and work the Kingdom of God was breaking in. To the disappointment of many, including his own followers, Jesus' approach did not involve any embrace of nationalism or support for the violent overthrow of ungodly pagan tyrants. As a naval officer, Izbicki asked, "What would Jesus do?" He certainly would have found nothing in the Gospel accounts that would indicate that Jesus would have supported war or lethal force in any way, unless we are talking about spiritual warfare fought with spiritual weapons. 2. When Jesus taught his disciples what it meant to live the Kingdom in this present age, that is, to allow God to be in charge of their lives, he spoke to them of a radically different ethic in which you would not resist the evil man; would turn the other cheek, go the second mile, love your enemies, pray for them, and do good to them. Jesus not only taught this, but lived it right down to his final breath. Certainly, what officer Izbicki was taught at the Naval Academy regarding enemies could not have been more starkly in contrast to the teachings of Jesus about the Kingdom life. The goal in war is to destroy and obliterate the enemy, not to show love, compassion, kindness, mercy, and concern. The nuclear warhead that the naval officer might be asked to launch, the grenade the soldier may throw, or the bombs dropped by a pilot would certainly accomplish the first of these objectives, without being mistaken in any way for the second. 3. This brings us to the behavior that we observe among the disciples as they were taught to live this Kingdom life. We have no examples of Jesus’ disciples killing anyone. The last time we see a follower of his taking up a weapon is one where there is an effort to defend an innocent and unarmed man. And, yet, in this case, Peter is told by Jesus, “Put your sword back in its place, for all who draw the sword will die by the sword” (Matthew 26:52 NIV). This view of a culture of force and Jesus’ rationale is expressed even more clearly in his statement to Pilate, where Jesus said, "My Kingdom is not of this world. If it were, my servants would fight to prevent my arrest by the Jews. But now my Kingdom is from another place" (John 18:36). Precisely because this is the Kingdom of God, fighting in the normal way against one's enemies is not an option. Quite in line with the in-breaking Kingdom, Jesus will set the example for his disciples when he utters these words from the cross, "Father, forgive them, for they do not know what they are doing" (Luke 23:34 NIV). Then, later, when one of them, Stephen, was stoned and was dying for his faith, he demonstrated that same heart, saying, “Lord, do not hold this sin against them" (Acts 7:60 NIV). This non-violent, non-resistance was not just for the redeemer in a great redemptive moment. It is for all disciples. While such a decision looks foolish to most people, it is a deliberate choice made because one is “conscious of God,” (see the wider context) and far from being a decision to do nothing, it is a decision to “entrust” one’s self “to him who judges justly.” It is a decision to affirm that God is indeed King and his ways will be vindicated. 4. In each of these points we are seeing the development of a Kingdom culture. In the Kingdom of God things are done dramatically differently from the way they are done according to the patterns of this world. The Kingdom is characterized by humility, mercy, compassion, peacemaking, forgiveness, honesty, unselfishness, sacrifice, and love for friends, strangers and even those people who wish to do us harm. The Kingdom is at odds with any system where there is a culture of force, self-defense, deception, retaliation, intimidation and disregard for the other especially those who wish you harm. In Ephesians 5, Paul speaks of the Kingdom culture and how certain things, like sexual immorality, are “out of place.” As we try to lay learning war and killing enemies alongside humility, forgiveness, meekness, and mercy, and love for enemies, it glaringly belongs to a different world and way of living life. As the community of Jesus, we are to proclaim the gospel of the Kingdom in word and in deed. We must demonstrate a life of the age to come in this present age; we are to do God's will on Earth as it is in heaven (Matthew 6:10). If we do harm to our enemies, we show the world the typical religion they have come to expect and give them cause to doubt the reality of the Kingdom. When the crusaders placed the cross on their breastplates and shields, and then in the first crusade left their Muslim enemies knee-deep in blood within the walls of Jerusalem, they were engaged in the most oxymoronic, contradictory activity possible, and a thousand years later their actions are still doing great harm. We must seriously consider a real possibility. It may just be that those who believe the only safe course is to rely on arms, force and violence, need to hear the very same words Jesus spoke to Peter. “Get behind me, Satan, you don’t have in mind the things of God but the things of men.” How can the church show the Kingdom of God to the world if it does not fully embrace the qualities of the Kingdom? 5. In order to train for war, then, a disciple must decide that there is a time and place to no longer imitate Jesus and to no longer demonstrate the distinctive Kingdom way of life. Even though he has stated that God is King, he must believe that there is a time and a place to put a cause, a commander or a country above his King. This, of course, completely contradicts the idea the absolute reign of God. In Jesus, we do see the Prince of peace, the one who taught us to love our enemies – that is, to treat them well. In his disciples we see those who followed the way of the cross and learned from him to show love and forgiveness, and trust him who judges justly. Again and again, we hear Jesus announce the gospel of the Kingdom, and we see that the rule of God has broken in, bringing a way of living life that is in sharp contrast with that of the world, and the amazing, loving treatment of enemies is a part of that life. Does Jesus’ teaching raise questions for us? Certainly. So do his teachings on lust, divorce and remarriage, lawsuits, justice and possessions. But with an attitude of wanting to do what is most like Jesus, what most fits with the Kingdom and what most fulfills righteousness, our questions can be answered. This brings us to a final point. The world's view of things is deeply embedded in our culture and equally embedded in most of us. This means that we are often profoundly emotional about this issue—far more than we even realize. We have grandfathers, fathers, brothers and sisters, aunts and uncles and cousins who have served in the military. Nationalism and patriotism run deep. Our countries usually celebrate and honor the armed forces. In the United States, conservative evangelicals –-those most known for their belief in the Bible--- compose the most pro-military element in society, even favoring the use of torture in interrogation more than those with liberal views of Scripture. Militarism is in the American culture, especially its self-professed Bible-believing religious culture. Consequently, Kingdom-thinking (on this and other subjects) will not be found among God's people unless it is vigorously taught and then reinforced with some regularity. We have seen how this must work with other deeply embedded cultural ideas (racism certainly comes to mind). Such thinking is not dislodged easily. Because the reality is that disciples have not immediately been of one mind on this issue, vigorous and respectful dialogue should be encouraged. Each Christian should listen, study and pray with a heart to “find out what pleases the Lord” (Ephesians 5:10). Michael Izbicki asked a good question—what would Jesus do? Each of us should another good question—what does Jesus want me to do? Jesus chose to do good, to save, to heal the man. But how would he have chosen to do evil, to destroy life? By doing nothing when he had the opportunity to do good -- even on a Sabbath. Considering this teaching, our subcommittee has wrestled with the potential ethical dilemmas that arise from our citizenship in the kingdom of heaven with its moral imperatives to both love your brother/family/neighbor (e.g. 1John 3:16) and to love your enemy (Matthew 5:44). Which is lawful when confronted with an enemy seeking to harm your family: to love your family/brother or love your enemy? And given the number of disciples who serve in militaries, many of our fellowship must wrestle with the dilemma on a more public level. Which is lawful when confronted with an enemy nation seeking to harm your nation: to love your family/brothers or love your enemies? Jesus’ sermon on the mount/plain brilliantly stretches us to live beyond the cultural pressures of this present age. He strips away our small-minded self-focused entitlements. No more revenge, no more lex talionis1, no more “that’s not fair,” and no more self defense (Matthew 5:39 -- plus Rom 12:19-21, 2Cor 11:20, 1Thess 5:15). Rather, we are to love, lend to, and pray for our enemies, and so we do on our better days. But does this preclude us from protecting the innocents? Jesus makes self defense indefensible for us, but what about selfless defense? I’ve concluded that selfless defense of the innocent is not only defensible, it’s morally mandated. To do nothing when I have the power to protect (1Cor 13:7) allows an innocent to be harmed or even destroyed. Loving my enemy does not mean that I allow him to harm my innocent wife/child/brother/neighbor. If even my dearest friend were seeking to harm my wife/child/brother/neighbor I would deploy all necessary means to stop him (not for revenge or even for justice but for the selfless protection of an innocent). While my friend would thank me for preventing his malice, my enemy may not. Nonetheless, I choose to do good through selfless action and not by doing nothing. Classic pacifists argue that doing nothing is not really nothing; rather, they assert that they are doing something of immense power — they are praying. Such faith is remarkable. However, even the Pharisees would argue that they were more trusting of God by doing nothing other than praying for the afflicted man on the Sabbath in the introductory dilemma. In addition to these references, we meet soldiers on a path to repentance that runs right into John the Baptist in Matthew 3 and Luke 3. John came preaching of a new kingdom and thus prepared the people for a radically new way of life to prepare for this new kingdom of God. His charge to “repent, for the kingdom of heaven is near” (Matthew 3:2) is the same message that Jesus preached (Matthew 4:17) as he began his public ministry. Within this context of preparation for the new kingdom, soldiers approach John to gain clarity on what they should do in order to produce fruit that proves their repentance. He charges them to stop their extortion and rather be content with their soldier’s wage. No “resign your post” or“put away your sword.” An argument from silence? If so, then John was ignoring the elephant in the Jordan — not his style. While the examples of metaphors and soldiers in the New Testament don’t settle any issues, they do keep us from overstating the pacifist’s case. A soldier who repents and is baptized into Christ does not need to resign his post if he is not violating his conscience. If his country is engaged in a selfless defense of innocents, then he may not have occasion for moral conflict. However — and this is important to note — such righteous military action is extremely rare indeed. If his country engages in unrighteous military initiatives, then he is forbidden to kill. A professional soldier is expected to use his discretion even on the field of battle. If he is called to violate his conscience then he should seek reassignment or resign. This is not a theoretical issue. I am in daily fellowship with many Christian soldiers. They are currently on career paths that steer them well clear of direct combat. Their contribution to potentially unrighteous combat is not totally different than mine as I pay taxes to fund the same effort. I have not counseled them to resign their posts. Most have been very effective at helping the kingdom break into their bases, forts, ships, and barracks as they have spread the gospel. However, if a disciple contemplates military service after baptism, I strongly counsel against enlistment as they will face compromising oaths, desensitizing conditioning, and there is no guarantee that he or she will not be assigned to a position that violates the demands of life in the kingdom. Which is lawful when confronted with an enemy seeking to harm your family: to love your family/brother or love your enemy? Which is lawful when confronted with an enemy nation seeking to harm your nation: to love your family/brothers or love your enemies? We’ve failed once by allowing the world to inform our consciences on these vital concerns. That was also a failure of doing relatively nothing. The world’s propagandists shouted loudly about patriotism while the kingdom’s preachers spoke sparingly on the implications of loving our enemies. Many of us left our brothers and sisters to discern God’s will without the full counsel of God on this matter. Let’s not fail again through overreaction. Well-informed spiritual brothers disagree on these questions. These ethical dilemmas sharpen our discernment as we strive to live out His kingdom in a fallen world. Let them also strengthen our unity through cooperation but without compromise on His moral imperatives.